Many neuropsychiatric diseases are associated with communication and/or social deficits. For instance, autism, traumatic brain injury, phthalate exposure, etc. Crucial to these research efforts are mouse models of these disorders. 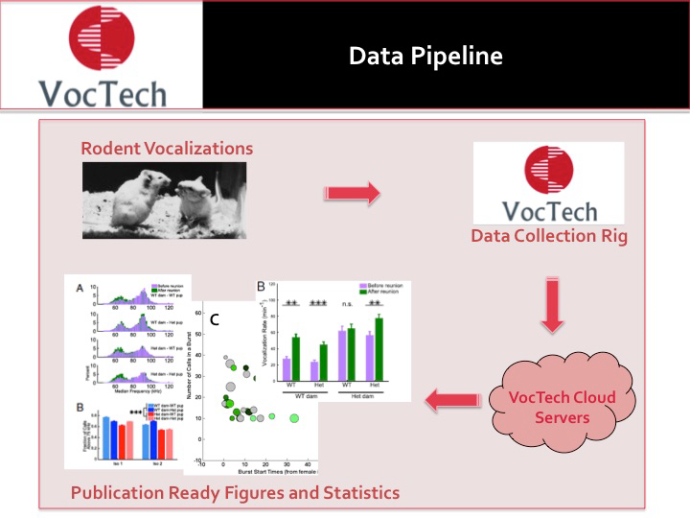 The use of Ultrasonic Vocalizations (USV) in the assessment of mouse models of disease has risen very sharply in the last 5-7 years and is rapidly becoming a standard behavioral test for communication and social deficits [1-3]. However, the adoption of an USV assay has been significantly hindered by the difficulty and expense of data collection as well as various technical and scientific issues surrounding the processing and analysis of USV data including the lack of the ability to collect synchronous video data. Many labs would like to pilot USV tests but are prohibited from doing so by the expense of obtaining the equipment and the relative level of expertise one needs to correctly collect and analyze USVs. This demonstration will provide attendees with an introduction to the collection and analysis of mouse USV data using a low-cost system developed by VocTech. 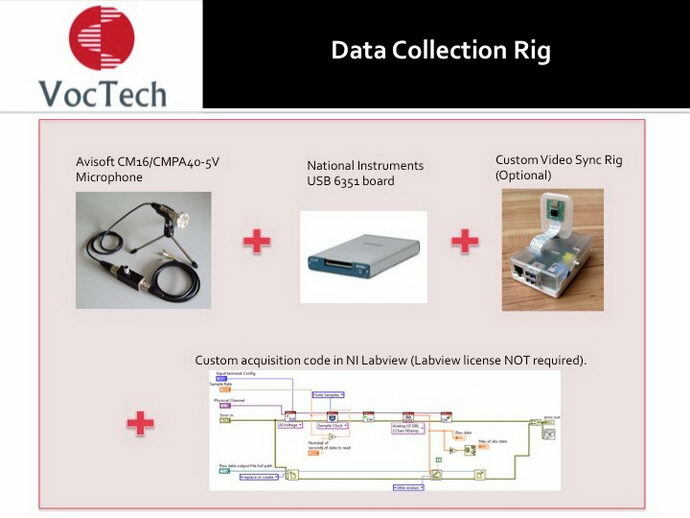 This system integrates off-the-shelf, state-of-the-art components with custom built modules for sound data collection and for the collection of synchronous video data (See below). Rigs are also available for ultrasonic playback. For data analysis we introduce a new analysis service that gives users publication ready analyses and only requires that the user upload their data to VocTech’s cloud servers where users can choose from an array of analysis and statistics methods (examples shown below). 1. Mu Yang, Elena J. Mahrt, Freeman Lewis, Gillian Foley, Thomas Portmann, Ricardo E. Dolmetsch, Christine V. Portfors, and Jacqueline N. Crawley, “16p11.2 Deletion Syndrome Mice Display Sensory and Ultrasonic Vocalization Deficits During Social Interactions”, Autism Res. 2015 Feb 7. 4. Young, D., Schenk, A., Yang, S.-B., Jan, Y. & Jan, L. Altered ultrasonic vocalizations in a tuberous sclerosis mouse model of autism. Proceedings of the National Academy of Sciences of the United States of America 107, 11074–9 (2010).